I will always start my blog with the statement that I am NOT a registered dietitian. Everything I share is based on my experience through trial and error. This is my experience with fats. It is short and to the point, considering talking technicality about fats can be an entire book. The topic of fats has been controversial for, well, at least a century. I have a nutrition book written in the early thirties that is completely against fats, so, there you go. I have been a victim of the fat paranoia as well. It was not until 2007, after a bodybuilding competition that my husband looked at me and made rudely honest comment about the wrinkles on my face. Unfortunately, I then became a victim of "Botox", until I got a bit smarter. My knowledge of fats did not enter my life until a good friend of mine, Toney Freeman mentioned to me one day as I was commenting on my frustration about holding fat on my thighs in a little weird spot that I should be consuming a bit of fat before my workouts. That opened a whole new world of exploration. And, it made me realize (feeling so ignorant) maybe including fat in my diet will help my skin. First, I must say, with all of the popular diets, of which I will not mention, comes the great idea that if one cuts out all of their starchy carbohydrates, they can eat as much fat as one wants, and any kind. This is not true. Quality of fats are extremely important. And gorging on fats is NOT a good idea (Uh...pork rinds? Really?). Sad, but too many people think that way. Too much fat will make one FAT., as well as beat up the cardiovascular system if one is eating bad fats, like trans fats. There are two types of fats, Saturated, which basically come from animals, with the exception of coconut oil. And unsaturated, which basically comes from plant sources. We need both. Our brain is 60% fat. Your brain needs fat in order to produce more cells. It increases blood flow and smooth nerves to the cells. I am thinking this might have something to do with so many neural diseases in this day and age. Maybe even increased anxiety and anger? Saturated fats, which are the fats that contain cholesterol, are just as important and Unsaturated fats. Fats are necessary for vitamin absorption, healthy organs, forming hormones, nervous system, aides in the absorption of vitamin D which helps make calcium available to bones and teeth, keeps skin lubricated, and is extremely important to the immune system. Now the neat thing about coconut oil is it contains lauric acid. Lauric acid has been used for suppressing viral infections of all kinds. It can be used for cooking, and I prefer it way over olive oil, which most people use. Since coconut oil, which is a cholesterol fat, is a medium chain fat, it is less stressful on the body to absorb, primarily the liver. 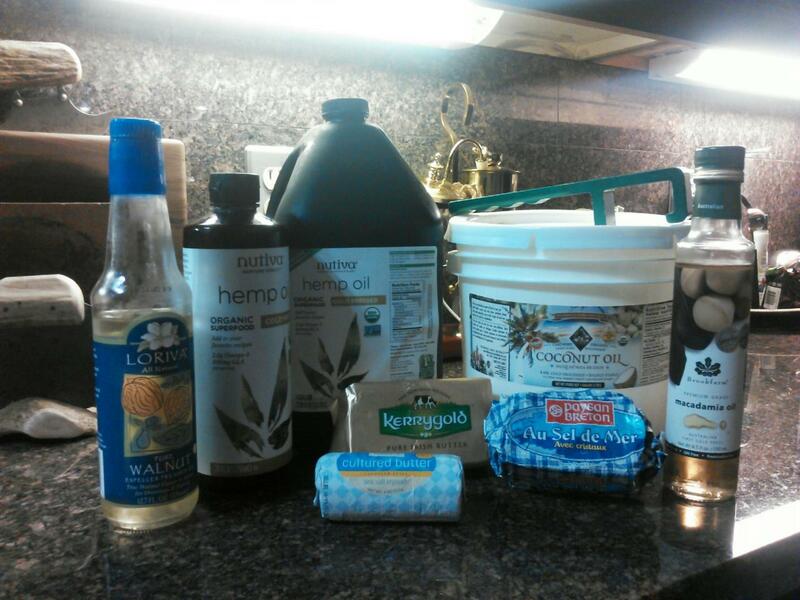 Hemp oil is an unsaturated fat. It also contain all the amino acids. It contains 3 to 1 ratio of omega 3 fatty acids to omega 6, which makes it an anti inflammatory. It MUST be kept refrigerated, for it is a live food and cannot be used for cooking. The two fats I have just described are my preferences, for one is saturated, and the other is unsaturated. They are plant based, and mostly these two are organic. Hopefully that will not change. Unfortunately, rise in sales might change that. Sad truth. Now I AM human. I do enjoy butter. I will eat butter, well, a few times a week. However, I always buy European for it is pure, and has the realistic, soft nature butter should have. A true organic butter will have the same properties. If I am baking, I prefer to use nut oils, like walnut, macadamia, or almond oils. Since I have added fats into my diet, I do not have hunger pains, I feel satiated quickly eating a meal, I have more energy, sleep better, and, my skin is healthy, and guess what? My body composition is always lean!